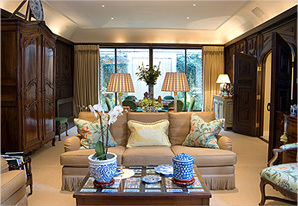 This is all about Rena Barclay Interiors, our suppliers, inspiration and projects. Rena graduated from the University of Georgia in 1986 with a Bachelor of Fine Art degree in Interior Design. 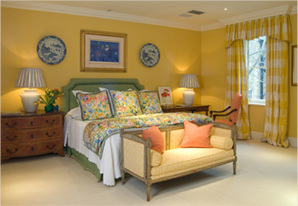 She worked for eight years with the renowned American designer Dotty Travis at Travis Interiors in Atlanta, Georgia. The intensive Sotheby’s professional courses on the History of 17th and 18th Century Decorative Arts and the History of 19th and 20th Century Decorative Arts continued her wide-ranging education in design, interiors, art, architecture and the decorative crafts. Rena became a member of the American Society of Interior Designers in 1991, after obtaining the National Council for Interior Design Qualification. Following two years as Manageress of Colefax and Fowler’s Fulham Road shop in London, she founded her own design firm, Rena Barclay Interiors. 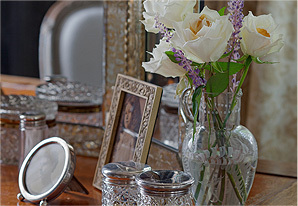 Rena works with an extensive and varied group of suppliers and artisans. This enables her to provide her clients with only the highest quality of finishing in all aspects of her design and build work. She continually searches for exciting pieces to enhance every interior she creates – whether it is a contemporary Howard Hodgkin painting or a Louis XVI Bergere. 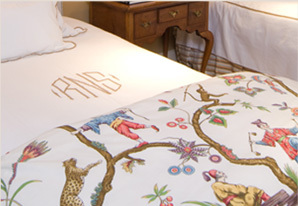 Rena draws on design elements from art, architecture, textiles and furniture. Her extensive travel lends a certain freshness to her design, employing cultural references to add depth and substance. The work of design icons such as Sister Parish, Billy Baldwin, Albert Hadley, Nancy Lancaster, Sibyl Colefax, John Fowler, David Hicks and Bunny Williams continue to inspire her. Commissions are varied and diverse with previous projects including English country houses, London residences and holiday retreats. Rena also has expertise in the restoration and conservation of properties in historic districts both in England and America. The breadth of her expertise and versatility of her design aesthetic have established Rena’s reputation as an interior designer who creates beautiful interiors that reflect the client’s lifestyle and individual taste. Rena’s extensive experience means she has the contacts, the resources and the attention to detail required to carry a project from inception to completion on time, within budget and – most importantly – beyond her client’s expectations.